Employability Skills is the need of the hour in today’s distressed economy. Most of the people are educated, hold decent degrees from reputed institutions but find it extremely challenging in not only finding a suitable job for themselves but also in sustaining it. The Centre for Monitoring Indian Economy has recently published a report in Feb 2018 stating how a whopping 31 million unemployed Indians are seeking jobs. This primarily can be because of two major reasons. On one hand, students are educated and do reasonably well in academics. However, when it comes to showcasing their capabilities at the time of the interview, they are seldom able to create an impact. This is because of the lack of practical skills imparted as a part of their education and their inability to convince the interviewers on the ways they would apply the knowledge learnt in a given hypothetical situation. On the other hand, vocational education programs which focus on job-specific skill development have still not gained prominence in our society. People still hold degrees like engineering and medicine in high regard without understanding the interest of their children and not having an adequate idea on the proportion of jobs available to employ them. Keeping the current challenge of youth, employers and society in mind our honourable Prime Minister Shri. Narendra Modi had announced it his endeavour to make our country a Skilled Nation. The objective of this initiative has been to promote skill development of our country’s youth, increase their employability and garner growth for the nation. National Skill Development Corporation (NSDC) is a Public Private Partnership promoted by the Union Ministry of Finance, with 49% equity held by the Government of India. NSDC was formed to achieve the target of skilling / upskilling 150 million people by 2022 by fostering private sector initiatives in the skill development space. Wagons Learning Pvt. 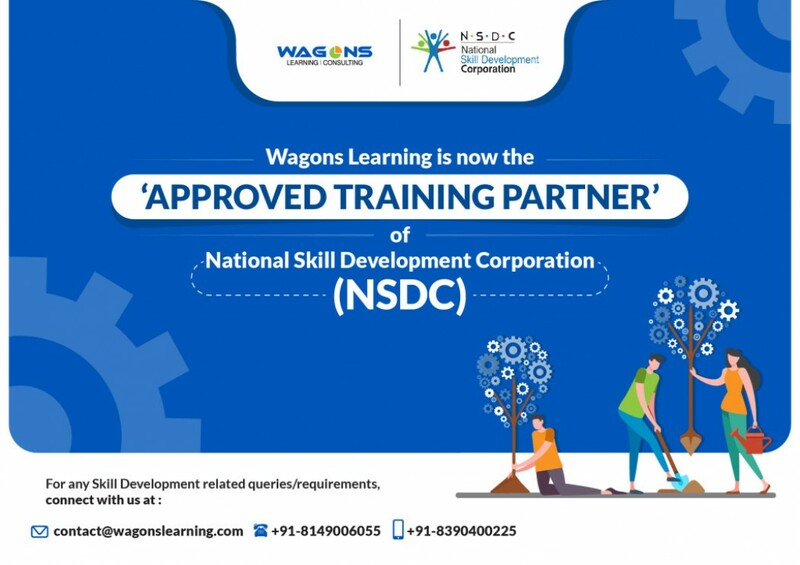 Ltd has been NSDC certified in September 2018, to conduct a range of skill development programs under the banner of WAGONS Skill Foundation. Wagons Skill Foundation has been taking regular initiatives to empower individuals through imparting knowledge, skills and national/international qualifications in getting suitable employment. Wagons Learning with its expertise in understanding the client’s learning requirements and its outcome-oriented approach will be able to reach out to a large section of the Indian population to develop their skills. The objective of such vocational training programs will be specific in nature and would be relevant to industries like Automobile and BFSI. This will make the productive workforce of the nation instantaneously adept and employable. On the Job Training will add to the practical skill-set and experience of candidates and would enable them to get skilled enough to be employed. Thus developing the skills of today’s youth is the need of the hour in dealing with the monster of unemployment. The curriculum needs to be changed right from schools to graduation and post-graduation. Life skills should be given more importance even at the school level. The youth of today needs to be mentally tough to face any kind of obstacles in life rather than succumbing to it through suicides and murders. If this major economic hurdle is not addressed at this stage, the nation may get affected with more number of crimes and scandals.